The complicated relationship of Jean -Paul Sartre and Frantz Fanon. 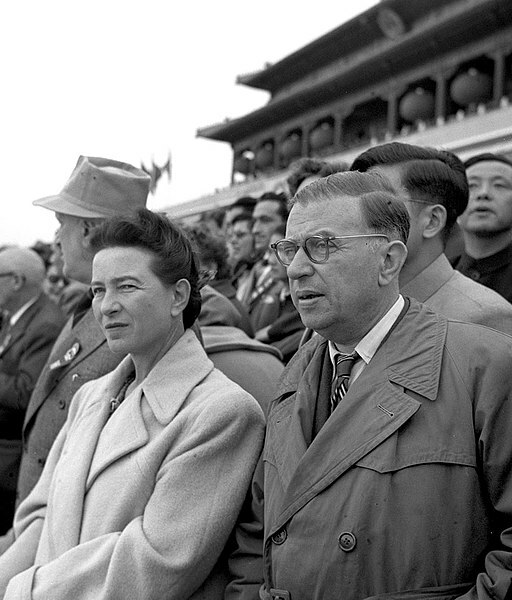 Simone de Beauvoir and Jean-Paul at the 6th Anniversary of Founding of Communist China in Beijing. Image credit Liu Dong'ao via Wikimedia Commons. Few European intellectuals concerned themselves with the dissolution of the imperial projects across the Global South in the mid-20th century; even fewer advocated outright for the independence of European-held African and Asian colonies. Jean-Paul Sartre was perhaps the most influential member of this latter group and began writing on anticolonial resistance in the late 1940s. Several years after the outbreak of the Algerian War of Independence in 1954, he became a vocal proponent of the Front de Libération Nationale (FLN), the Algerian nationalist group that waged armed struggle for liberation. Sartre famously condemned the French military’s widespread, systemic use of torture on FLN members and Algerian civilians, and backed unconditional independence for the colony. After Algeria’s victory in 1962, Sartre remained steadfast in his anticolonial activism: he would write on topics such as the Cuban Revolution, US intervention in Vietnam and unjust French immigration policies. We begin in 1948: Sartre authors “Black Orpheus,” an essay on the Négritude movement and its role in the global struggle for decolonization and freedom. Négritude was a Francophone cultural movement aimed at reconciling, redefining, and reclaiming black identity in a colonial world. It originated in Paris, and primarily featured writers and artists from West Africa and the Caribbean. Still, “Black Orpheus” is an important intervention in Africana philosophy, and more broadly, non-western thought: according to Robert Young, Sartre “recognized the complexity of African epistemological roots,” and his engagement with Négritude affirmed his belief that “the pursuit of political liberation had been accompanied by the development of new forms of knowledge, a counter-modernity set against that of the West.” And furthermore, in context of Négritude poetry (especially Senghor’s work), these sentiments are not as jarring as they may appear to a contemporary audience. Yet the essay drew criticism from Fanon, who challenged Sartre’s analysis of Négritude in his first book, Black Skin, White Masks. The essentialist current of Négritude, and Sartre’s embrace of it, proved to be easy fodder for Fanon—in short, reinforced the dangerous colonial binaries that kept Africans subjugated and because it left these ideological structures intact, could not provide a path to liberation. But the more egregious offense was Sartre’s treatment of Négritude: to reduce it to a mere instrumental step in the revolutionary process—a “temper tantrum,” according to Reiland Rabaka—represents a fundamental misunderstanding of Black agency. To collapse this formulation of Black identity, however misguided and ineffectual it may be, into a colorblind universalism is to, in the words of Lewis Gordon, facilitate “the death of blackness through eventual absorption into the light of whiteness.” In this universalism, Fanon explains a phenomenological oversight in “Black Orpheus,” writing that Sartre “forgets that the black man suffers in this body quite differently from the white man. Fanon’s relationship with Négritude was complicated, perhaps even contradictory in some moments. In instances such as these, he appeared somewhat protective of it but, by and large, he remained critical of the movement throughout his career, as he believed the passive recognition of an essential Africanity would not free colonized subjects. Liberation would only be achieved through revolutionary action. Sartre provided a preface for Fanon’s magnum opus, Wretched of the Earth, which was published shortly before Fanon would succumb to leukemia in December of 1961. Wretched drew devotees across Africa, Asia, and South America across the 1960s-1970s: its release, together with the FLN’s victory in Algeria and Fanon’s untimely death, exalted the West Indian psychiatrist to the pantheon of Third World luminaries. Stuart Hall observed that the book was the “Bible for decolonization,” and the myth of Fanon and his revolutionary work proliferates in the present day. Even today, Fanon’s corpus, consisting of thousands of pages written on a vast range of subjects (including psychiatry, politics, sociology, theater and literary analysis), is frequently collapsed into his now infamous prescription of revolutionary violence. This cannot be disassociated with Sartre’s contribution to Wretched: in a sense, Sartre delivered Fanon to the western world, and in doing so, colored Fanon’s intervention as exclusively a provocative meditation on violence. There’s no doubt that Sartre aided the fight for decolonization, going far beyond his peers in advocating on behalf of the colonized, subjugated and wretched of the earth: V. Y. Mudimbe goes as far as to call Sartre an “African Philosopher” for all his contributions to the struggle. In a time when non-white thinkers required an endorsement from a gatekeeper in order to be taken seriously (has that time truly passed? ), Sartre’s preface lent Fanon’s oeuvre credibility and enabled its dissemination across the western world. What does allyship look like today? In its popular usage in left-activist circles, it primarily comprises the performative, self-congratulatory, curated, and largely commodified gestures of actors who ostensibly hope to uplift marginalized communities. With allyship comes a certain social currency, which at a given moment, may happen to be in vogue (consider the infamous ‘safety pin’ as a prototypical example of allyship in this sense)—its usage in such circles usually engenders some degree of repulsion. Typically, those who would self-identify as allies to racial justice would push for more diverse representation on corporate boards, in lieu of any meaningful restructuring of Black political economy. They would protest the construction of a border wall with Mexico, while turning a blind eye to the unlawful detention of immigrants that has been carried out for decades. They protest the over-policing of Black communities, but don’t challenge the very premises of a carceral system that cages millions of people every day. In his preface of Wretched, Sartre writes, “Stuffed with wealth, Europe granted humanity de jure to all its inhabitants: for us, a man means an accomplice, for we have all profited from colonial exploitation.” Proper allyship necessitates the recognition and ownership of these inconvenient realities. Then, it requires a commitment to a course of action beyond the milquetoast, and past the conciliatory: it must seek the annihilation of these structures. For all of his shortcomings and bumbling mishaps, Sartre indisputably claimed this colonial truth, and remained genuinely committed to upending the power structures that oppressed, pillaged and plundered peoples across the Global South—his relationship with Fanon provides a fascinating case study of the contours of allyship and, furthermore, a model to salvage allyship from its present, denigrated condition.